WASHINGTON, DC -- In 2016, the No. 1 tourist destination of Ukraine was the lifeless town of Pripyat, evacuated after the deadly reactor meltdown at Chernobyl in 1986. The monument to the victims of the Chernobyl tragedy is in front of a new shelter installed over the exploded reactor at the Chernobyl nuclear plant, Chernobyl, Ukraine, Tuesday, Nov. 29, 2016. A massive shelter has finally been installed over the exploded reactor at the Chernobyl nuclear plant, one of the most ambitious engineering projects in the world. Today, Ukraine relies on nuclear power for 53 percent of its power generation, but is risking another nuclear accident on a scale greater than Europe — and the world — could imagine. The problems facing Ukraine’s nuclear power industry are multi-faceted, but the main issue is the same one plaguing the whole of the former Soviet republic — corruption, which is breeding a lack of accountability and mismanagement of the sector’s critical infrastructure. Ukraine’s nuclear power plants are supposed to be regulated by the State Nuclear Regulatory Inspectorate of Ukraine (SNRIU), which by law is an independent regulatory body. In recent years, however, it has become standard practice for the leaders of SNRIU to be appointed by the state nuclear power plant operator, Energoatom, instead of through a rigorous, independent selection process. This, perversely, subjugates the regulator to the whims of the operator. If Energoatom cannot meet certain safety standards or deadlines, its bosses simply inform the regulator of such, and the deadlines are extended or eliminated, public safety be damned. In addition, many positions at the regulatory body remain empty. For example, the position of the chief state inspector of nuclear and radiation safety has been vacant for three years. Other key posts of the Ukrainian nuclear regulator remain vacant. Operating in such a permissive environment, Energoatom no longer feels any pressure to observe the best domestic regulatory or international practices in its procurement operations. Instead of adhering to the procedures of the International Atomic Energy Agency (IAEA) and hiring companies with a proven track record, Energoatom started using dubious firms that do not possess the necessary experience and expertise to do work. International inspections are pro forma and only carried out infrequently. All this corruption has led to extremely dangerous decisions putting the safety of Ukrainians and people across Europe at great risk. For example, the life spans of two units of the Zaporizhzhya nuclear power plant, the largest in Europe, were extended, while seismic safety measures were ignored. An inspection found that the emergency diesel generators, which are responsible for cooling the reactors in the event of a power loss, were virtually incapable of doing so. Failed standby generators were the cause of the meltdown at Japan’s Fukushima plant after the tsunami destroyed the electric grid support for the reactor. There is a geopolitical twist to this story. The West has been pushing the Japanese-owned Westinghouse as an alternative source to Russian nuclear fuel for Ukraine and the rest of Eastern Europe. This is being done not for safety or market reasons, as often stated, but to damage Russian interests in the region. 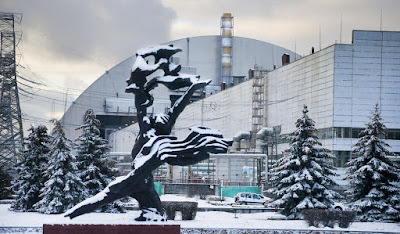 However, there is a problem: The reactors using a combination of Russian and Western fuel had to be shut down about almost every month due to safety concerns. The Westinghouse product is simply not as good as the Russian fuel made for the Russian-designed reactors, creating a highly dangerous situation where the reactor could fail. In addition, parent company Toshiba has announced that Westinghouse, its money-losing U.S. subsidiary, has filed for Chapter 11 bankruptcy. That filing brings into question the long-term viability of Westinghouse’s fuel supply to Ukrainian reactors. The original manufacturers have advised they will not take responsibility for Ukraine going against their advice and using another fuel supplier. This may be a Chernobyl waiting to happen. Unfortunately, the procurement process has also succumbed to time-tested, Soviet-legacy corruption methods. The Ukrainian anti-corruption agency, NOBU, recently uncovered bribes paid by the Czech company Skoda JS to officials at Energoatom. Illegal withdrawals of public funds for cable products, working with offshore companies that sponsor terrorism worldwide, and overpayments by Energoatom of hundreds of millions of UAH, have all been uncovered by Ukrainian anti-corruption officials. One would hope that Kiev will soon realize that the nuclear industry is not only a risk to the country’s energy security, but also that the country’s overall security cannot be ensured without a fully independent and functioning nuclear regulator. This is bigger than just Ukraine alone. The future of Europe is at stake.